We are one of the leading manufacturers of this range of best quality industrial borosilicate glasses and PTFE products, in this range we are offering to them this range of Sight Flow Indicator. Manufactured using best quality fiber and glass as well, this indicator range is basically used for viewing fluids in pipelines. This range has been fabricated using best grade borosilicate glass along with the compliance to standards predefined by the industry. In this range we are also offering MS Frame Sight Glass and Frame Sight Glass. We are instrumental in bringing forth to our clients this range of Sight Flow Indicator. 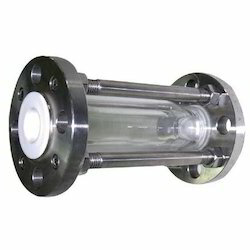 Variedly used for keeping a view-track of fluids in pipelines, this indicator is consistent of a very heavy but straight glass wall tube that provides complete visibility and a negligible pressure drop. Available with flange connection, in sizes 25 DN to 150 DN. A sight flow indicator basically consists of a small housing equipped with a glass window, which is inserted in a run of pipe to observe the flow of the fluid in the pipe. Sight Flow Indicators are available with special materials to meet various applications. Optional materials are available for the housings or flanges. 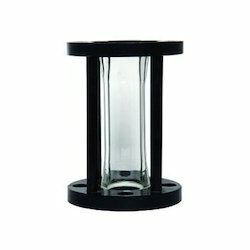 MS Frame Sight Glass Flow Indicator offeredis designed to be used between a wide range of non-transparent pipelines for observing liquid flow. With possibility of usage in horizontal and vertical pipes, these are constructed so as to provide complete vision from any angle. These are also popular for high thermal strength as well as resistance to corrosion & thermal shocks. 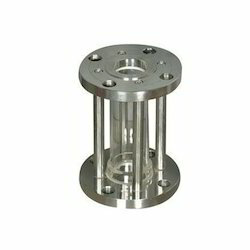 Frame Sight Glass Flow Indicator offered comprise device finding usage in checking in line flow of different fluids. These allow observation of liquid flow between any kinds of transparent pipelines including in horizontal as well as vertical pipeline options. Further, its unique construction also provides for complete view from every angle. We are engaged in offering a wide range of Frame Sight GlassFlow Indicator to our clients. These are used between a wide range of non-transparent pipelines for observing liquid flow. 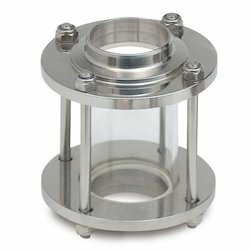 These frame sight glass are designed in such a manner to check the flow of liquid from any angle.